This iconic 5* hotel is the place to stay for true luxury. Located in the heart of Mayfair, it boasts one of London's most indulgent afternoon tea experiences and is home to a restaurant run by Simon Rogan, the chef behind successful pop-up Roganic. An art deco masterpiece, Claridge's is one of London's most luxurious hotels. 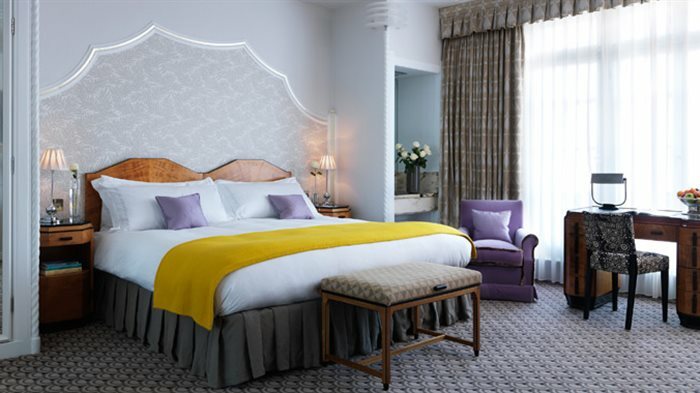 In the heart of Mayfair, Claridge's luxury hotel in London is an art deco masterpiece perfectly placed for the city, the shopping districts and leafy Hyde Park. With award-winning service, Simon Rogan's Fera restaurant and some of the biggest hotel suites in London, Claridge's Mayfair hotel is a sumptuous retreat. Much of the 1929 decoration, when eighty new rooms and a stunning ballroom were added, remains to this day making Claridge's a unique art deco jewel. Served in the Foyer and Reading Room, the afternoon tea at Calridge's is multi award-winning. Named the Tea Guild's Best Afternoon Tea in 2006, 2011 and 2012, and presented with an Award of Excellence an impressive five times, Claridge's is one of the top locations for Afternoon Tea in London. Served in the Foyer and Reading Room, the hotel boasts all the details needed for the traditional British custom. The art deco interior of Claridge's saw a stunning refit in 1999, bringing it back to its awe-inspiring former glory and worthy of its affectionate title "the extension to Buckingham Palace". The centre piece of the Foyer is a huge glass chandelier by Dale Chihuly, adding to the magic of the venue, and the Reading Room is ideal for intimate occasions. Diners are accompanied by a pianist and harpist while they choose between more than 40 different blends of tea from around the world and devour classic finger sandwiches, pastries and moist, fluffy homemade raisin and apple scones served with Marco Pollo jelly and Cornish clotted cream. There are three delectable options: the traditional Afternoon Tea, the Champagne Tea and, for really pushing the boat out, the Rose Champagne Afternoon Tea. Seasonal options for the Chelsea Flower Show, Lawn Tennis and Christmas are also available. If you want to join the ranks of princes, politicians and personalities, this is the only place to sup afternoon tea. The celebrated chef behind Roganic took over the Claridge's restaurant in 2014. Simon Rogan, the celebrated chef behind Roganic, a famous and successful pop-up in Marylebone which ran from 2011 to 2013, is the chef behind Fera at Claridge's, heading up the restaurant previously run by Gordon Ramsay for 12 years. The name Fera, which means 'wild' in Latin, reflects the seasonal ingredients used in Rogan's style of modern British cooking, a style inspired by his love of homegrown produce and fresh ingredients sourced from his own farm in Cumbria - "a defining factor" at his London restaurant at Claridge's. Dishes change depending on the season so in spring/summer choices might include mackerel with seawater cream and caviar tucked into squid ink bread, stewed rabbit with lovage, and grilled salad with truffle custard - the winning dish that Simon created on the Great British menu. Staying close to nature - and the art deco characteristic of Claridge's - interior designer Guy Oliver has given the dining room a complete redesign. Paying homage to the hotel's iconic 1920s design, Oliver has installed natural walnut tables - without tablecloths - marble walls, bronze lights, and warm green wool curtains, and presents the open kitchen as theatre, visible through double doors surrounded by a large-scale painting with stools provided so guests can watch the chefs at work. This sublime restaurant is the pinnacle of London hotel luxury. A wondeful treat at one of London's great luxury hotels, The Reading Room at Claridges is famous for its stunning art deco interiors, superior food and top notch service. The lavish art deco interior of The Reading Room is truly a feast for the eyes with deep colours and tactile surfaces covering every inch of the intimate, classically styled room with its huge cut marble fireplaces. For the ultimate British experience, afternoon tea in Claridges' Reading Room is a must, however stick around for dinner and you'll be treated to a sumptuous feast of elegantly prepared dishes created using the finest possible, fresh seasonal and sustainable ingredients and presented in the most beautiful, artistic and delicate ways. This David Collins-designed bar is the perfect place to sup on fine vintage champagne. Situated within one of London's top hotels and the recipient of countless positive reviews, Claridge's Bar rarely sees a quiet moment. Filled with people you'd happily mingle with, the David Collins-designed bar provides a stylish option to while away an evening. Designed in 1999, Collins was given the brief to 'slip quietly into the new millennium while keeping a firm hold on the last one'. The result is a beautiful art deco interior with inviting deep red leather chairs and a grand silver ceiling. It boasts a wide selection of rare drinks, from fine vintage champagnes to coveted spirits and wines. Enjoy indulgent Sisley treatments and one-to-one fitness advice on the top floor of Claridge's. Found on the top floor of Claridge's, the Health Club & Spa provides the chance to enjoy relaxing treatments while looking across London. In the spa, a team of professional therapists use Sisley products for their luxury facials, body treatments and massages. Guests can also opt for a manicure or pedicure and waxing treatments. Further to the spa, hotel guests can also take advantage of the fitness centre, where top-class personal trainers provide one-to-one tailor made training sessions. From cheap budget hotels to luxury 5 star suites see our deals for hotels, including Holiday Inn London Kensington Forum from 38% off.